Bone tissue engineering offers an alternative promising solution to treat a large number of bone injuries with special focus on pathological conditions, such as osteoporosis. In this scenario, the bone tissue regeneration may be promoted using bioactive and biomimetic materials able to direct cell response, while the desired scaffold architecture can be tailored by means of 3D printing technologies. In this context, our study aimed to develop a hybrid bioactive material suitable for 3D printing of scaffolds mimicking the natural composition and structure of healthy bone. 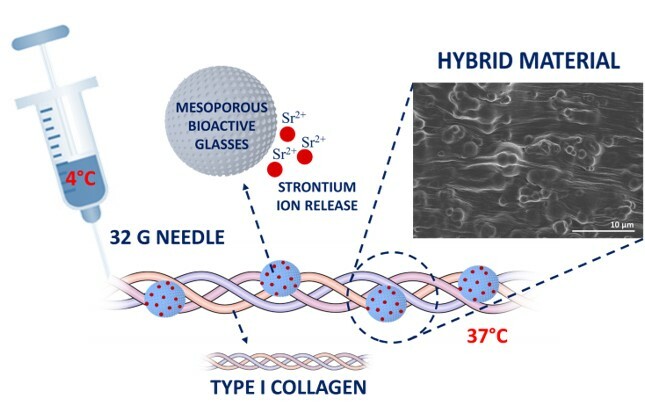 Type I collagen and strontium-containing mesoporous bioactive glasses were combined to obtain suspensions able to perform a sol-gel transition under physiological conditions. Field emission scanning electron microscopy (FESEM) analyses confirmed the formation of fibrous nanostructures homogeneously embedding inorganic particles, whereas bioactivity studies demonstrated the large calcium phosphate deposition. The high-water content promoted the strontium ion release from the embedded glass particles, potentially enhancing the osteogenic behaviour of the composite. Furthermore, the suspension printability was assessed by means of rheological studies and preliminary extrusion tests, showing shear thinning and fast material recovery upon deposition. In conclusion, the reported results suggest that promising hybrid systems suitable for 3D printing of bioactive scaffolds for bone tissue engineering have been developed.